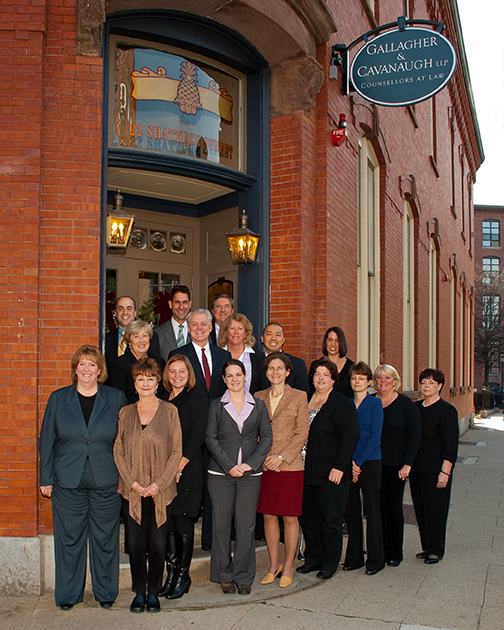 Gallagher & Cavanaugh's greatest resources are the skill and experience of its lawyers and supporting professionals. At Gallagher & Cavanaugh, one of our goals is to continue to increase the diversity of our workforce by actively hiring, developing, retaining and advancing the best lawyers, paralegals, and administrators from a wide range of backgrounds. We believe that we can only provide our clients with the best possible representation if we reflect the diversity of the clients and communities we serve. Front Row (left to right): Sheryl Bourbeau, Mari Funaro, Courtney Stanton, Brianna Sullivan, Pamela Pardoe, Laurie King, Bridget Coughlin, Kathleen Sheehan, Beverly Woods. Middle Row (left to right): Eileen Donoghue, Michael Gallagher, Andrea Batchelder, Jay Lee, Amy Souza. Back Row (left to right): Andrew McNaught, Paul Schor, Richard Cavanaugh. We take pride in our lawyers crafting creative strategies tailored to the particular needs of our clients. Our lawyers are graduates of top-tier colleges and law schools. Each has experience in litigating complex tort and commercial matters, and all are encouraged to publish, speak, and instruct others in litigation and other areas of the law for continuing legal education providers, local, and state bar associations, and business and industry groups. They are admitted to practice before the state courts of Massachusetts, New Hampshire, Pennsylvania, and California as well as federal district courts throughout the United States and the U.S. Federal Court of Appeals, and the U.S. Supreme Court. The ability to organize and manage information in an efficient and productive manner is an essential attribute of effective case management and prevailing in a dispute. Our support professionals are proficient in the use of the Internet and other computerized databases, both legal and technical, to support our clients with the resources of the information age. We have an extensive database of forms and briefs to facilitate the cost-effective preparation of necessary documents. Should our clients require additional technical or other expertise, we employ a multi-disciplinary approach to problem solving by enlisting other professionals where warranted. For example, Gallagher & Cavanaugh has a wealth of experience in engaging experts across a wide range of disciplines to help map out solutions to the varied problems and disputes that our clients face. Over the years, we have compiled an extensive bank of information regarding expert witnesses and other professionals that include resumes, pleadings, deposition transcripts, and publications. We also subscribe to various expert witness information and transcript services.